A great balance of spicy and tangy, this is a delicious condiment to have with chicken, pork, fish or veggies. I was inspired by Action Bronson when he made this, but he charred his chilis and tomatoes directly in a fire. Sadly I do not have access to open fire cooking in Brooklyn, but will be making this again in the North Fork in our fire pit this weekend. Preheat oven to broil. 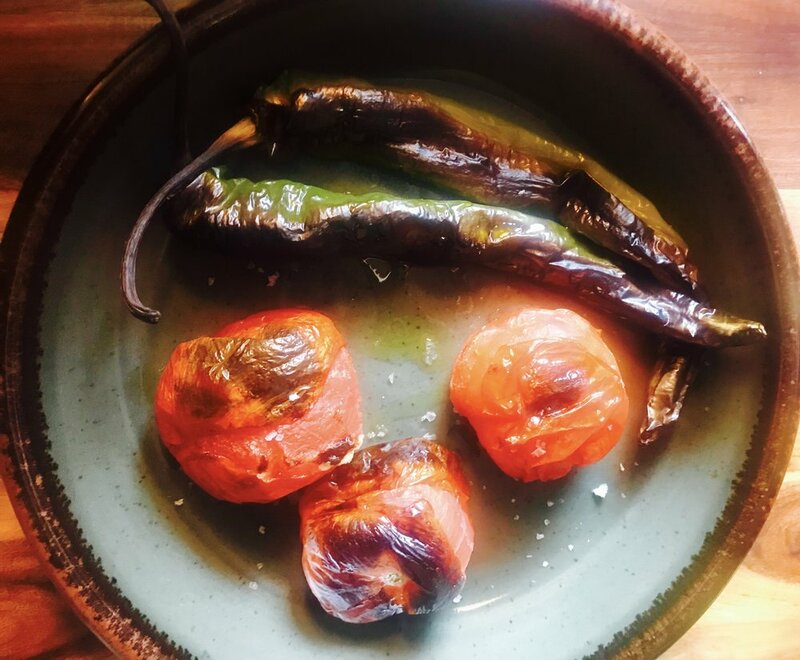 Place chilis and tomatoes on a baking sheet and broil until charred and softened, about 10 minutes per side. Remove from oven, place together in a bowl and cover tightly with plastic wrap. Let cool for 15-20 minutes. Remove stems from chilis, chop well and place in a medium bowl. Chop tomatoes and add to bowl with chilis, vinegar, olive oil and season to taste with salt.